Be the first to share your favorite memory, photo or story of Flora Kathleen. This memorial page is dedicated for family, friends and future generations to celebrate the life of their loved one. 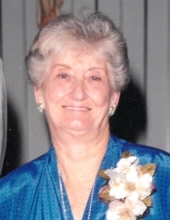 Flora Kathleen Mason, daughter of the late John Odis and Bessie (Sharp) Glass, was born August 9, 1930, in Carthage, Mississippi, and departed this life January 14, 2019, at Cox Health in Springfield, Missouri at 88 years of age. Kathleen grew up and attended schools in Mississippi in the Smith area and in Flora. She grew up during the depression era, was always a hard worker, and did things for herself as long as her health permitted. Kathleen was saved at an early age and was raised Southern Baptist. When she moved to Norwood, she attended Union Grove Caudle church as long as her health permitted, more than forty years. She married Thomas A. Mason on June 3, 1960 in Canton, Mississippi. Tom had two sons, Billy Thomas and Tommy Lee. Kathleen and Tom had one daughter together, Tommie Karen. On June 1, 1969, Kathleen and Tom moved their family to a farm, north of Norwood, Missouri, where they raised beef cattle and ran a dairy farm. They also had large vegetable gardens. She would can and freeze produce all summer and share with their neighbors. Kathleen was known as a wonderful cook and would always prepare large, old-fashioned, home cooked meals for family and friends. She loved baking for school events. Everyone always enjoyed the special snacks she prepared for seasonal school parties. She was also an exquisite seamstress. She had the ability to look at a photo and create, sew, or make anything. She made many wedding gowns, bridesmaid gowns, prom dresses, and did alterations for many neighbors and for children’s clothing. She also worked side by side with her daughter in her sewing business, “Dust-catchers Originals”. Mom always called what they were sewing “just dust-catchers” thus the name. She also loved to make quilts. After the death of her husband in 1987, she remained on the family farm until June 2015. Because of her health, she moved in with Karen and lived there until her passing. She loved her grandchildren with all of her heart and would do whatever they wanted to do whether it was fishing, building something, sewing something, or just sitting on the porch and talking. The same went for her neighbors and friends. She was always willing to help others and would respond at the drop of a hat. Besides her parents and her husband, she was preceded in death by two brothers, Johnnie and Herman Glass, one sister, Lee Morrison, and two grandsons, Chris and David Mason. She is survived by one daughter, Karen Ross and her husband, Mike, two sons, Billy Mason and his wife, Mary Ann, all of Mountain Grove, Missouri, and Tom Mason and his wife, Susan, of Norwood, Missouri, one brother, Charlie Glass and his wife, Nita, of Nixa, Missouri, one sister-in-law, Rita, of Florida, four grandchildren, Jessica and Robert Owens of Minot, North Dakota, Joseph and Ashley Ross of Mountain Grove, Missouri, Bridget and Andy Dierks of Springfield, Missouri, and Beth Agne of Rogersville, Missouri, eleven great-grandchildren, two great-great-grandchildren, Cindy and Chad Sullivan and girls, (Thank you, Cindy for helping with mother. ), and many other relatives, friends, and neighbors who will miss her. To send flowers or a remembrance gift to the family of Flora Kathleen Mason, please visit our Tribute Store. "Email Address" would like to share the life celebration of Flora Kathleen Mason. Click on the "link" to go to share a favorite memory or leave a condolence message for the family.